We know that content marketing takes time. It’s SEO, which takes time to build up. But, a strong SEO strategy is the best way to get cheap organic leads for your real estate investing business. When it comes to content marketing, though, we know it can be a struggle to come up with more and more original stuff. If you’re a rehabber, keep in mind that your audience is motivated sellers who are looking for a quick way to sell their house. If you’re a wholesaler, your target audience is both motivated sellers and other real estate investors, so you’ll have to appeal to both of them. SlideShare has become a great way to make quick, engaging, SEO content that is easily shared between people on all social medias. You know these. They’re essentially slide shows that appear in your newsfeed. They’re all over FaceBook. The best part about SlideShare is that is functions as another social media platform. On SlideShare, you can have followers who will like, share, and contribute to your page. The rules for engagement on this site are just like every other social media, though. If you’re not an active participant, then you’re not going to get much attention. But, you can share these interactive slides on other social medias. FaceBook is a great platform for SlideShare to be spread to! And, SlideShare helps build up your search engine optimization, which we know is the whole point of being online. If you’re working on a project, document it and make a SlideShare of the process. This will drive other real estate investors to click through because you’re giving them valuable insider information about your process. This is information they can learn from. This also helps to establish you as a real estate investing professional, adding to the content you already have to build your reputation with motivated sellers. Remember, the more they trust you, the more likely they are to do business with you. Brand building is easy with SlideShare. Let’s say your business focuses on being a “problem solver” for your motivated sellers. You can make a SlideShare that’s a compilation of your customer’s stories. Make one for each type of situation you’re target audience can find themselves in. Situations like: foreclosure, divorce, inheriting a house, vacant land, etc. The more you make, the stronger your content marketing material becomes. These titles not only feature buzz words that will help drive traffic, but they show the readers that this article will answer their specific questions with actionable tips they can use. These listicle posts should still function the same as your other blog posts. You always need to drive traffic back to your short and long forms to get the reader to convert into a lead. For example: if you’re a rehabber and you post a listicle with the title “Top 10 Tips for Avoiding Foreclosure”, one of the tips should be to sell to a cash buyer that has a link to your website. This tip section should talk about how selling to cash buyers is the most simple way to deal with the foreclosure of a house. You want to highlight how simple the process is for someone reading this article. Second example: Let’s say you’re wholesaling houses and you write the article titled “Find More Local Wholesalers In 5 Steps”. You’re a wholesaler! You should be putting links to your website in the opening to the article, in the end, and as one of the 5 tips. This is a great way to organically build your buyers list! And, since it’s a blog post, it’ll be on your site for as long as you want for no money! Talk about a great content marketing idea for real estate investors, huh? From our video marketing article, we already know that video content increases conversions by 86%. And, if you’re posting your videos with descriptions and tags, all you’re doing is building your online presence. This is a great content marketing idea for real estate investors because there are different kinds of videos you can make, increasing your content library and providing lots of easily digestible material for your target audience to engage with. If you have a digital content producer – great! – but we know that, unless you’re a huge real estate investing business, you probably don’t. You could either spend the time to film, edit, and distribute your own videos, but that’s time consuming. So what are you waiting for?? Get started making videos! A specific content marketing idea for real estate investors is to make a “real estate do’s and don’ts” article for your target audience. Again, what the article covers will vary based on what type of real estate investing you’re doing. Of course, these are suggestions for someone looking to target motivated sellers. You can easily modify these suggestions to fit a different type of real estate investor. “Do’s and Don’ts” articles are a great, actionable source of information and advice for readers to take and use. Just like writing listicles, you always need to drive traffic back to your website. Always include links back to your website so that whoever reads your article can see that your business is the solution to their problem and take action. You always want your content marketing to stay current. The second you start falling behind, you’re going to lose rankings. That’s why a great content marketing idea for real estate investors is to highlight trending questions in the real estate world. Finding these trending topics is simple. There are a few ways to do it. As an active real estate investor, you should already be subscribed to lots of different real estate related things on your social medias. You should be listening to real estate investing podcasts, going to local RIA meetings to network, and following other real estate investors, agents, and groups on platforms like FaceBook, Twitter, Instagram, and Youtube. A quick way to find trending topics for real estate investors is easy. You can Google the phrase “trending topics for real estate investors”, do a “trending topic” search on Twitter, and listen to and read updating podcasts and blogs. When you find a topic that’s getting lots of traction, your next step should be to become a part of that conversation. Engage with the discussions you find online on platforms like forums, FaceBook, Twitter, and so on. The more you engage, the more you build your online presence. Documenting is a great way to make lots and lots of easy content. 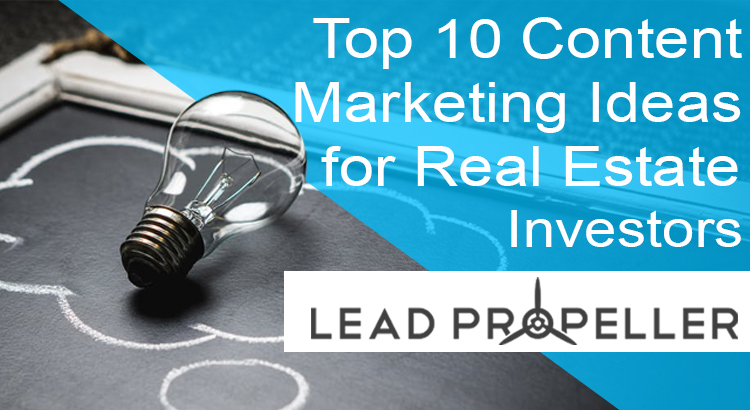 In fact, it’s one of the stronger content marketing ideas for real estate investors because it’s so simple to do! You already have to take notes on your houses, so why not turn those notes into a blog post? From there, that blog post can be made into a short video from Lumen5 that can be posted to your social media accounts or sent out in emails. Then the pictures used in the blog can be posted separately with links to the article and your business on places like Instagram, FaceBook, and Twitter. Remember, posts with visual content are 40 times more likely to get shared on social media. Documenting doesn’t have to be all spreadsheets and blog posts. Have fun with it! Use Instagram to show pictures of your process. Our friends at Flipping Junkie do a great job with documenting their business on Instagram. Take it as an example, post every part of the process! Next time your at a property, whip your phone out and just start recording. Live streaming is gaining traction on social media. Walk through one of your properties and live stream the house on FaceBook! When you live stream, your followers get an alert and can watch in real time. Talk about engagement! Are you snapping? A lot of people are. In fact, there have been real estate agents who have sold houses all because of SnapChat! Don’t believe us? Check out this article from Gary Vaynerchuk that covers the story. Aside from using SnapChat to sell your properties, it’s a great way to document your business, AND build you brand. In fact, you can make custom geo-filters that people in your area can use! It’s such a great way to spread your business’s name around. Just upload your logo, design it online at SnapChat’s website, select your target area and dates you want it to run, and submit it. It’s that easy! We suggest using custom geo-filters to target other real estate investors instead of motivated sellers. This is a great strategy to let other investors know that you’re an active investor in the area, and to spread your brand name on more social media platforms. Plus, it’s one of the most engaging content available. Other investors can take pictures and selfies with your business’s logo! Pretty cool, yeah? Very similarly to SnapChat, Instagram has a “stories” feature. These stories are a great place for repurposing your content marketing because it’s easily digestible for audiences, and can be taken from pre-existing content. That way you don’t always have to be creating new content every single time you post. Take the videos you make, the live streams, the snapchats, the pictures from your properties, your blog pictures, etc, and upload that to Instagram as a story! Then just sit back and watch your followers engaging with the content. In these stories, you do want to put your business’s name, logo, and website somewhere in the images or videos. Instagram is an awesome platform to share images, but they don’t hyperlink web addresses in the descriptions. You should still put your business’s URL there for SEO, but it won’t be clickable. Content marketing ideas for real estate investors like this one are similar to documenting your business, except these posts should specifically show the details of the deals. This adds to the transparency of your business and builds your credibility as a competent real estate investor. You can see a good example of post-deal summaries at this blog. This is the best place for you to feature your customer testimonials as well. As part of your post-deal summary, you need to include how you worked with your customers, how their problem was changed by you, and most importantly how well you worked with them. This will help to increase your online credibility and build your professionalism with future clients. If you’re looking for a hands off way to build your SEO and online presence, you can’t go wrong with LeadPropeller’s content packs. Ok ok, I know this is going to sound a little sales pitchy, but hear me out. These content pack are built with short codes in them. Basically, it ensures that each article is specific to your target market, business, city, and state. All of that information that you put in the business info section when you were setting up your LeadPropeller account gets automatically inserted into these articles in organic spots. That way, you don’t have to spend days and days getting carpal tunnel writing and optimizing blog posts when we’ve already done the hard part for you. Plus, these articles are built to auto-release once a week without you needing to go through the back end and schedule anything. Of course, you can if you want. But since we’ve already got them set to auto-publish, the only thing you’d have to do is buy the content pack. Each one of these content packs is 8 – 10 professionally written, SEO built, personalized, and auto-set to publish articles that are specific to real estate investing. For example, if your target audience searches something like “How to sell a house that heeds repairs without fixing it” guess what? We have an article for that! Which means, your business will start ranking for these relevant keywords without you needing to do anything. How cool, right? As far as content marketing ideas for real estate investors go, this one is sort of a no brainer.